John Galt was born in Irvine, made his name in London, money in Canada, and died and was buried in Greenock in 1839. He was Coleridge’s favourite novelist and a star contributor to Blackwood’s Magazine. 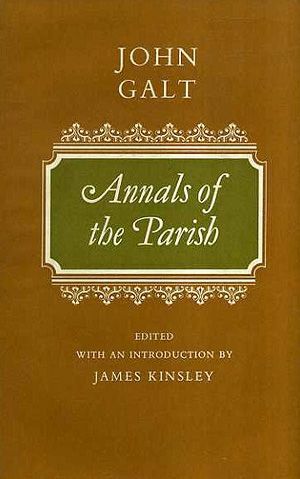 In the 1820s, he wrote a series of Scots stories, or ‘theoretical histories’ as he called them, his ‘Tales of the West’, the greatest of which is his novel Annals of the Parish. In many ways, it is the miniature masterpiece of small-town Scottish life, a portrait of human character and social change more particular and more beautifully coloured than anything by Walter Scott. Reading it, you begin to imagine that Flemish painting found its Scottish counterpart in a writer of fiction: the book is full of human things and natural oddities, while the humour is very gentle and the language exact. The book is narrated by the Reverend Micah Balwhidder, a Presbyterian minister in the Ayrshire town of Dalmailing, and covers the years 1760 to 1810, the period of Robert Burns and the Industrial Revolution, when the economic and moral shape of Scottish life was changing in ways both explicit and invisible. The novel charts all this: the work of smugglers at Troon, new births in the parish, old deaths, the efforts of the press-gangs, the rise of the local economy, the business of ‘cadgers by day and excisemen by night’, the opening of a new dance school at Irville, ‘run by Mr Macskipnish’, visits to Glasgow and Edinburgh, the day of the country fair, described with a rare vernacular beauty. It’s a precursor to Dickens in terms of detail and to Flaubert in terms of style. Galt was interested in small incidents and he understood, in a very modern way, how a Scottish novel could work by accretion: social detail, human voices and psychological inflection working together to raise reality. He created several works of art this way, but Annals of the Parish is singular mainly, I think, because of the way Balwhidder’s narrative voice works. He is hungry for the milk of human kindness, yet also he is vain and conceited, concerned – perhaps too concerned – with the workings of prosperity. The Reverend Balwhidder contains multitudes, and his distinctive humanity, his small failings, his linguistic rightness, make him as great a fictional hero, to my mind, as Don Quixote or David Copperfield or Leopold Bloom. Further reading: Sir Andrew Wylie (1820) is a grand historical epic, and arguably one of the first murder mysteries; The Radical (1832) traces the campaign for parliamentary reform.